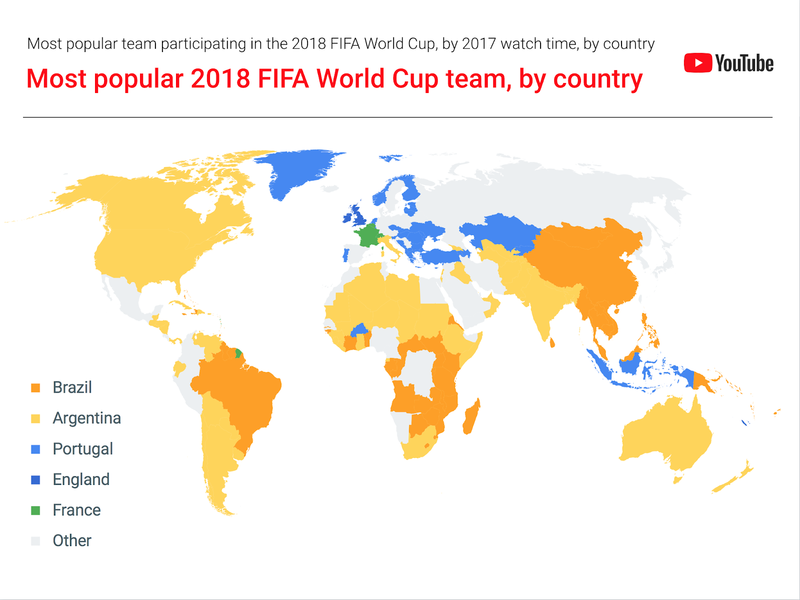 YouTube has provided an analysis of football-related trends over the past year on its platform ahead of the FIFA World Cup. The video-sharing platform found that videos about Latin American teams led the way in 2017, with the top five most popular national teams – Argentina, Brazil, Peru, Portugal and Mexico – all from the region. 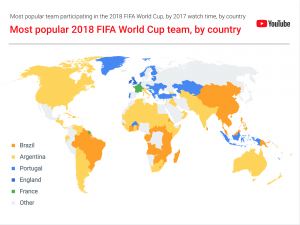 Brazil was the most popular team across Brazil, large parts of southern and central Africa, China and south-east Asia, while Argentina was the top-scoring team in North America, northern Africa and South Africa, India, much of the rest of Latin America and Australasia. Videos about leading players including Lionel Messi, Neymar da Silva Santos Jr and Cristiano Ronaldo, all had an 80% increase in watch time last year compared with the previous year. Ronaldo, Messi and Neymar were the top three players in the US and the UK, while Neymar, Ronaldo and Paulinho were most popular in Brazil, and Kylian Mbappé, Neymar and Ronaldo were most popular in France. YouTube said that match recaps, highlights and videos of trick shots were popular on the platform, and that the time spent watching match recaps on YouTube has more than doubled over the last two years. Since the last FIFA World Cup watch time for football game highlights has grown nine times, while viewing time spent on trick shots has grown by 50%. World Cup broadcasters including Fox, Telemundo, the BBC, ARD, NHK, Kwesé, Televisa and Latina Televisión will be using YouTube to air World Cup highlights, and live coverage of games will be shown in markets where YouTube TV is available.